While many football fans may have been distracted by Euro 2016, this year’s most exciting football tournament has been happening right under our noses! The Fair Trade Euro 2016 tournament for schools was hosted by Taverspite Primary School in Pembrokeshire last Friday and was the third Fairtrade football tournament organised by the Fair Trade in Football Campaign, sponsored by Hub Cymru Africa and supported by Fair Trade Wales. Twelve schools across Pembrokeshire and Carmarthenshire each represented one of this year’s Euro qualifying countries and were welcomed to Tavernspite Primary School with Fairtrade refreshments – and of course all of the matches were played with Fairtrade footballs! … Sweden! Well done Tenby Junior Community School for a fantastic performance!! For more information about Fairtrade footballs, take a look at our new film, ‘Playing Fair: The Story of Fairtrade Footballs’. 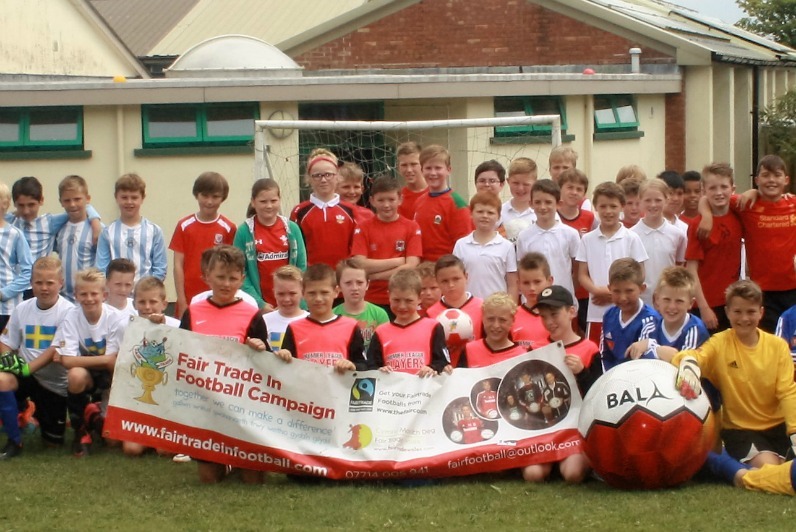 Fairtrade footballs can be ordered from Bala Sport.